Members of Nintendo's huge, vocal fan base have been salivating in anticipation of the Wii for some time. But the curious and appreciative onlookers that I've noticed during my recent testing of a retail unit suggest that the Wii's appeal may well extend beyond the Nintendo faithful. The Wii seems poised to make console gaming more social, immersive, and--most importantly--fun than it has ever been. Nintendo has announced that more than 1 million units of the $250 Wii will be available when the model makes its official U.S. debut on Sunday. So your odds of getting your hands on a Wii in the near future are better than your odds of snagging a PS3. Cryogenically freezing yourself to avoid the wait, as one of the characters in South Park did recently, won't be necessary. Below is a video of the Nintendo Wii in action. To view it, you'll need to have the Adobe Flash Player plug-in installed. The Wii is the most compact of the next-generation consoles. It weighs just 2.7 pounds and measures 8.5 inches long by 6 inches wide by less than 2 inches thick. It has clean, sharp lines and an Apple-like glossy white finish, though we'll undoubtedly see units in black and possibly other colors at some point. 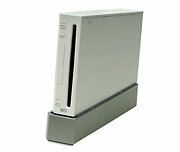 Like the PlayStation 3 and the Xbox 360, The Wii can be oriented horizontally or vertically, thanks to its angled plastic stand. Once you've positioned it, your next step is to plug in the power supply (which is about the size a laptop brick), and connect the bundled composite audio/video cables to your television. To output content at the Wii's maximum 480p resolution in 16:9 wide-screen format, you'll have to purchase the optional component cable separately. Next you must set up the included controllers: a Wii Remote and a Nunchuk--a joystick-style controller that connects to the remote for additional game control. I first hooked up the supplied sensor bar to the console and placed it just under the display of my TV. The sensor bar allows the console to communicate wirelessly (via Bluetooth) with up to four Wii Remotes at a time. The Wii Remote works for games within a radius of about 30 feet and functions as a cursor-type pointing device within about 15 feet. In my testing, the on-screen pointer jittered slightly when I tried to use it from farther away. The final setup steps are to place two AA batteries into the Wii Remote, rearrange your furniture as necessary to clear plenty of space in front of the TV (to avoid any "Wiinjury"), and fire up the console. Our colleagues over at GamePro have scanned in the Wii's manual, and it's worth a look to get an even more complete idea of the Wii's setup routine and overall features. PC World also has a detailed account of a test drive of the PlayStation 3; and a review comparing the PS3 and the Wii. The first time I powered up the Wii, I had to create a gamer ID, which the system uses to save your games and also to identify you online. After creating my log-in and entering the date and time, I was presented with the Wii Menu. This interface, which uses a television/channel metaphor, is where you access the Wii's mostly free online features. The first thing I wanted to do was jump online. I was particularly interested in the "sleepless" WiiConnect24 service that lets the console automatically download information, even when it's on standby. The Wii includes a built-in 802.11b/g wireless network adapter, but you can also go online by using extra-cost options such as a LAN adaptor or a Wi-Fi USB adaptor that shares a PC's Internet connection. I tested the integrated Wi-Fi, and setup was a snap. The Wii scanned for and found my wireless ADSL router, and it let me type in the network's WEP key via an on-screen keyboard. I found that I could select letters and move around the Wii Menu using the Wii remote in the same way that I'd use a computer mouse. The remote even vibrated subtly in my hand as I hovered over menu options. Tactile feedback: great! Wii Shop Channel (and Virtual Game Console): Nintendo's online store will eventually offer various extras to download, but the most notable one at launch is the Virtual Console, which will allow gamers to download and play games from past consoles such as the Nintendo 64, NES, Super NES, Sega Genesis, and TurboGrafx16. Nintendo will offer 12 classic console games at launch, including Donkey Kong (NES), SimCity (SNES), Super Mario 64, Sonic the Hedgehog (Genesis), and Bomberman '93 (TurboGrafx16). Some 30 virtual console games should be available for download by year's end, according to Nintendo. The online shop will operate on a payment system called Wii Points. You'll be able to purchase Wii Points at retail outlets or with a credit card online. They'll be available in blocks of 2000 for $20 a block (which means that 1 Wii point is worth a penny, and 100 are worth a dollar). The retro NES games will start at 500 Wii points, TurboGrafx16 titles at 600 Wii Points, SNES and Sega Genesis games at 800 Wii Points, and N64 classics at about 1000 Wii Points. Internet Channel: A customized version of the Opera Web browser (with Flash support) will be available for the Wii, Nintendo says. We can't tell whether it'll be ready for download at launch, nor how much it will cost, but Nintendo has confirmed that you'll have to surrender Wii Points to obtain it. Forecast Channel: On this channel you'll be able to browse a 3D globe to obtain weather forecasts that are automatically updated each day. News Channel: This channel will automatically display the latest news from around the world. The Associated Press will supply the headlines, Nintendo says. Wii Message Board: Here you can post messages on a calendar for other Wii players in your house, exchange messages with Wii users around the world, and gather information about the latest game updates. Photo Channel: The Wii's photo management and sharing options are far deeper than those of the PlayStation 3. You can use this channel to access digital photos via the Wii's SD card slot or a mobile phone. And besides just viewing the images, you'll be able to zoom in; create slide shows, a photo gallery or photo puzzles; draw on images; adjust colors in various artistic ways; and send your creations to other Wii users. Mii Channel: This channel invites you to create customized caricature avatars for yourself; use them in a variety of Wii games; and save them to the Wii Remote for use later--even at a friend's house. You can store up to ten Mii characters on a single Wii Remote. Disc Channel: Clicking here starts a Wii game disc that you've inserted. Wii controllers are designed to be perfectly usable whether you're left- or right-handed. For games, the Wii Remote has a plus pad (D-pad), a large A button, an underside B trigger, and buttons labeled 1 and 2. The main surface has other buttons as well: power up, minus and plus (for escaping game menus, and the like) and a home button (for switching back to the Wii Menu and checking controller battery life). The Wii Remote also contains a control for adjusting force feedback, a built-in speaker, a wrist strap (in case the remote flies out of your hand), and four blue LED lights that indicate which player/controller number you've been assigned. An expansion port on the remote lets you connect the Nunchuk and other optional controllers. The supplied Nunchuk controller is used in conjunction with the Wii Remote and provides an analog thumb stick, and two front trigger buttons labeled C and Z. A second Wii Remote costs $40, and a second Nunchuk costs $20. Another option is a classic-style controller (which Nintendo has priced at $20) for non-motion-sensing titles such as fast-paced fighting games. At E3 last spring, I took photos of the classic controller and Nintendo's concept "Zapper," a gunlike shell for the Wii Remote. As time goes by, you can expect independent vendors to offer a multitude of plastic shells to slide your Wii Remote into--all of them promising to improve your gaming experience. One product already on sale is UbiSoft's $20 Wii Steering Wheel. Web rumors suggest that Electronic Arts may be working on a way to let you strap the Wii Remote to your foot in order to play its FIFA soccer game. Another rumor has it that the Nintendo DS handheld's touch screen will be able to act as a controller for Wii games. Nintendo has experimented with different controllers in the past. Anyone remember the Power Glove or Virtual Boy? This time however, the company's efforts seem to have produced a winner.